Sam Allardyce is poised to formalise his return to football at Crystal Palace over the next 24 hours after his ill-fated 67-day stint as England manager, as the struggling Premier League club seek to make a swift appointment following the sacking of Alan Pardew. 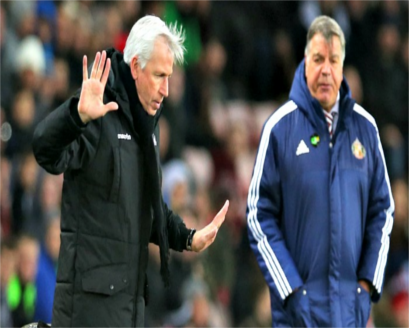 Palace dismissed Pardew on Thursday after almost two years in charge with the team having lost eight of their past 10 league games, and 22 over the calendar year, to slump to within a point of the relegation zone. Allardyce departed his position with the Football Association in September after one match having been filmed discussing FA rules on third-party ownership by undercover reporters. The 62-year-old’s representative was holding talks with Palace’s chairman, Steve Parish, on Thursday evening. The possibility of losing out on a manager who has never been relegated from the top flight appears to have prompted Palace, whose players had been granted a day off on Thursday, to act before the Christmas programme in the hope they can confirm the hiring of Allardyce as a replacement. The American major shareholders, David Blitzer and Josh Harris, who each purchased an 18% stake in the club a year ago, had grown increasingly alarmed at the team’s slump in form, which was threatening their considerable investment, and had been made aware of Allardyce’s credentials some time ago. Indeed, it is understood they had been sent a dossier offering detailed analysis of the club’s squad, with assessments of each player, towards the end of last month, while Palace were embroiled in a six-match losing streak that culminated in a calamitous 5-4 defeat at Swansea on 26 November. Allardyce had questioned the team’s fitness and also indicated what he feels would need to be done in the January transfer window, when Palace had hoped to sign the Leeds left-back Charlie Taylor, to instigate a revival. He would seek to bring in his own backroom staff, including Sammy Lee as an assistant and new fitness coaches and analysts, and the American co-owners were increasingly swayed. Pardew, however, had retained the support of Parish until very recently and appeared to have bought himself some time by picking up four points from games with Southampton and Hull City, for all that the revival was choked by losses to Manchester United and Chelsea last week. His in-game decision-making had been called into question in the first of those defeats, but he had attended the club’s Christmas party at London’s Quaglinos restaurant on Tuesday, and was due to face the media before continuing preparations for the Watford game on Friday. There had been support within the Palace hierarchy for Chris Coleman – no formal approach has been made to the Football Association of Wales – and Roy Hodgson and Roberto Mancini had also been mentioned. Yet Allardyce’s track record appears to have been key, particularly in convincing Harris and Blitzer, given his achievements in steering Bolton Wanderers and, more recently, West Ham United and Sunderland to Premier League survival. Although the FA is still waiting to conduct its own investigation into its former manager’s conduct during his brief tenure with the national side – the relevant evidence has yet to be passed over by the City of London Police, who have confirmed Allardyce is not the subject of a criminal investigation – there is nothing to prevent him taking up the reins of a club side again immediately. Allardyce would inherit arguably the strongest squad in Palace’s history, with money to add to his options next month, and a trip to Arsenal on New Year’s Day to follow that to Vicarage Road. His assistant, Keith Millen, is expected to take training on Friday and may yet be placed in caretaker charge for a fourth time at the club for next week’s fixture at Vicarage Road.